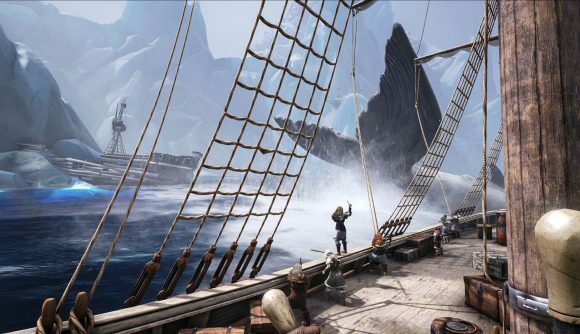 Players of pirate MMO Atlas bore witness to some especially bizarre apparent hacks today, where objects ranging from massive whales to planes and tanks started to rain from the sky. While some players were quick to place the blame on cheaters, developer Grapeshot Games attributes the incident to an admin’s compromised Steam account. “Earlier today,” Grapeshot says on the official forums, “an admin’s Steam account was compromised and used to cause some devastation on our Official NA PvP Network. To be clear this was not caused by a hack, third party program, or exploit. We have taken the appropriate steps to ensure this does not happen again.” The affected server was rolled back five hours as a result. The Atlas subreddit is currently covered in clips of the incident. Clips from BurkeBlack and CrReaM show whales falling from the sky. Another BurkeBlack clip has a plane flung at his galleon. A further clip from SniperNamedG showcases a tank hitting land and blowing stuff up – all a bit anachronistic for Atlas’s fantasy setting. Many players have been quick to lay blame at the feet of Black Butterfly, a group with a reputation for hacks and exploits, since many of the attacks seemed to be centered on their territory. Grapeshot has made no explicit mention of action against any group of players. Atlas currently hosts a ‘mostly negative’ rating on Steam, with issues ranging from hackers to general bugs and glitches, but Steam Charts suggests there are still plenty of people playing it. Typical daily peaks are well over 30,000 players.